I have to admit that when an e mail landed in my inbox about a buy and sell gift card website I was skeptical to say the least. My initial reaction was why would someone want to sell a gift voucher for less money than it is worth? Then I thought about it. I think we have all received a voucher before for a shop that we never usually shop in. I know the boys have been sent them where the nearest shop is 45mins drive away. Whilst it's lovely to receive a Sainsbury's gift card, it isn't that helpful if you only ever shop in Tesco. Maybe you won a gift card in a raffle or giveaway, but are struggling to think of anything to buy? Well ZEEK might just be what you are looking for. Here you can sell a gift card for slightly less than the origin value, but it means that you get the cash. To spend on what and more importantly where you want. Then you need to look at purchasing a gift card. I like a bargain, but saving money requires organisation and thinking ahead. I was given some credit to try out ZEEK for myself. As it was for review purposes, I played it safe with a Sainsbury's gift card. I have a store just around the corner and can go there easily. The money saving was £4 which is ok but some of the other deals are much better. I downloaded the app to my phone and it was really simple to use. I chose a £50 Sainsbury's giftcard. I used £45 of credit and paid £1 via Paypal to verify the purchase. The card was then sent out to me via registered delivery and took a few days. That was it. Simple. £50 to use in Sainsbury's for £46. It went well so I tried again, this time with a Next voucher. Here I mainly used my own money - but hey that is what I would do when I go into Next. But this way I received a £30 card for the price of £28. Not a massive saving this time but again every little helps! The only downside is once you have sent up your app to connect to Paypal it is really really easy to buy vouchers. Note to self make sure the boys don't play on my phone! It is worth noting that the cards come recorded delivery and you need to sign for them. If you are spending your saving on parking charges to go and pick them up then that is no good, just make sure that it is delivered where it can be signed for. A good money saving site! Thanks for sharing - I will check it out! Only downside is having to wait if it's not an online one. Def worth looking at if you are ordering off Amazon! Great post - havent heard about this - will definately take a look! I think this would be more useful for selling than buying, but it's certainly worth a look! It sounds a very good idea. I occasionally get gift vouchers that I won't use, and these days it's quite expensive to sell on Ebay. Definitely worth looking into. I haven't seen this before. Hubby has a couple of giftcards he might not use atm - he's so hard to buy for that people got him giftcards and he still hasn't used them lol. This sounds like a fab idea. Looks like it could be interesting! Not a big enough saving for me. this is such a good idea, i have wasted a few in the past. I figure sometimes we win things as well so might be worth a look. I never realised you could even sell vouchers on ebay! Not sure how much you have to pay to sell them. This sounds like a money saving deal. Never heard of this scheme before. Will look into it. 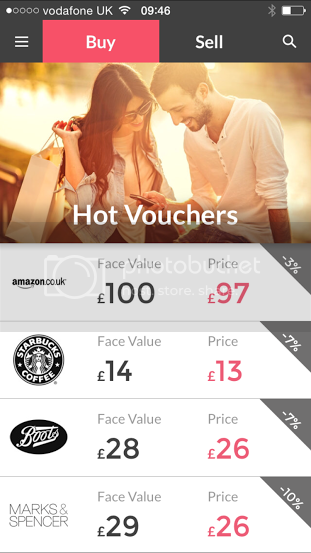 Great idea for selling vouchers you can't use! I think it's a great idea. I've heard quite a bit about them over the last few weeks, keep meaning to explore it as I have a gift card I am thinking of selling but haven't actually got round to it yet...you've just inspired me to actually get galvanised into action! Sounds a great idea. Just waiting to use it!